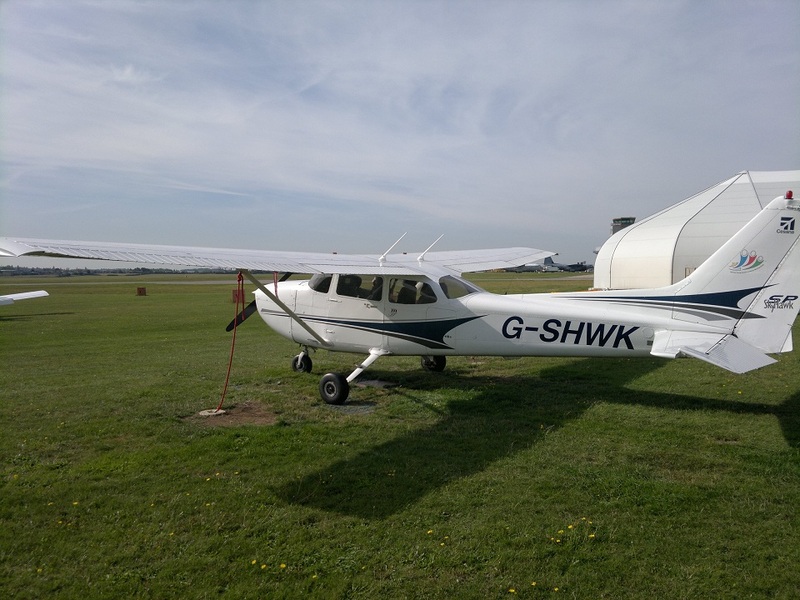 Such was this lessons arrival, the weather system showed scattered clouds at 700ft, I half sarcastically (but it might have come across slightly serious or in hope) asked my instructor “Are you ok with that?” (knowing full well the answer would be a no). However the two instructors present seemed pretty confident it would soon burn off and be back up at 900-1000ft. Go check-out the aircraft and we’d see what it was like in 20 minutes. I had my choice of aircraft today, as G-SHWK (Whiskey Kilo) is now my firm favorite, I opted we take it for a spin. We’d do a turning climb to 1,500ft, 500ft above normal circuit height, cut the power (to idle) halfway downwind. Hold the nose level until 70 knots (best glide speed) and then trim for that airspeed, before deciding when to turn on to base, take some flaps if required and start making our transition onto final. A reminder not to try and pull up to extend the glide, as flying below the best glide speed would only shorten the glide – that’s instinctively hard to do, it’s essentially saying: If you know you’re undershooting there’s nothing left you can do about it (yeah you can go around, but you don’t glide for fun, this is supposed to be a practice for an effective emergency). Checkout : Non-Responding Fuel Gauges. All untied, I flicked the master switch on and was met with a demoralising sight: Both fuel gauges were flat lined 🙁 I found myself watching and hoping they’d come up, not encouraged by the ammeter bouncing up and down, but finally the right hand tank registered a full tank. I decided to crack on, see if anything else was acting up and then report the full status of the plane rather then stopping when there could be more not playing ball. The landing light was still bust, but I’ve been told enough times not to worry about it. On inspection you could not only hear the fuel in the tanks glugging, but they were visually filled to the brims in both tanks. It turned out that when fully tanked, the fuel gauges don’t register and they’d sought themselves out once we were on our way. The weather had improved as well, we were good to go. Flying without Coffee = Bad. Turned the Avionics switch on before checking if the starter warning lights were extinguished (effectively skipping an item on the checklist). Abbreviated the call sign before ATC had done so. Made a mess of the Take-Off Briefing. The first circuit radio call was another fine example of why I won’t be flying without coffee again. Circuits…..more than I can remember. Some lessons you can remember every second, others there’s so much going on that by the end it’s a blur of stuff that happened. This was one of the latter. The climb up to 1,500ft went well and all leveled off nicely. Turning on to final was all driven by where the textbook said to turn rather than experience, it seemed to work well enough though and the approach ended up looking really quite good. In fact this circuit went fantastically well until about 20ft when we slammed into the runway like I’d never landed a plane before in my life! Just not pulling back smoothly and firmly enough and flying straight into the runway, arrrgh we’re not going back to that lack of back pressure nonsense, we’re just not. Second time around, was good all the way round the circuit and with a better landing but still hard enough to be disappointing. The steeper approach gives a different perspective so it’s all a bit different to the million previous approaches made and what the view out of the window looks like when you should start adding in back pressure. You know at the back of your mind, if you lose height, you can’t get it back. So somewhere subconsciously you’re keeping the airspeed as flat as you can and more than you might if you knew you could just add a bit of power later to fix the height loss. Much better landing, almost soft enough to be happy with, not quite as centred as I’d have liked, but by all accounts plenty good enough. Glide Approach to the Grass Runway? Funnily enough if I was happy with any of the approaches, decisions on when to take flaps and the landing itself. This was it, if I’ve ever landed on the grass this well, I can’t remember it. 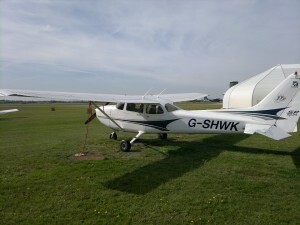 There’s something much more appropriate about the concept of doing a glide approach & landing onto a patch of grass…… Maybe that’s what made this landing better. My instructor started to get me to do the radio calls requesting permission to do a “High Glide”, they’d be sick of hearing that request by the time this was over. 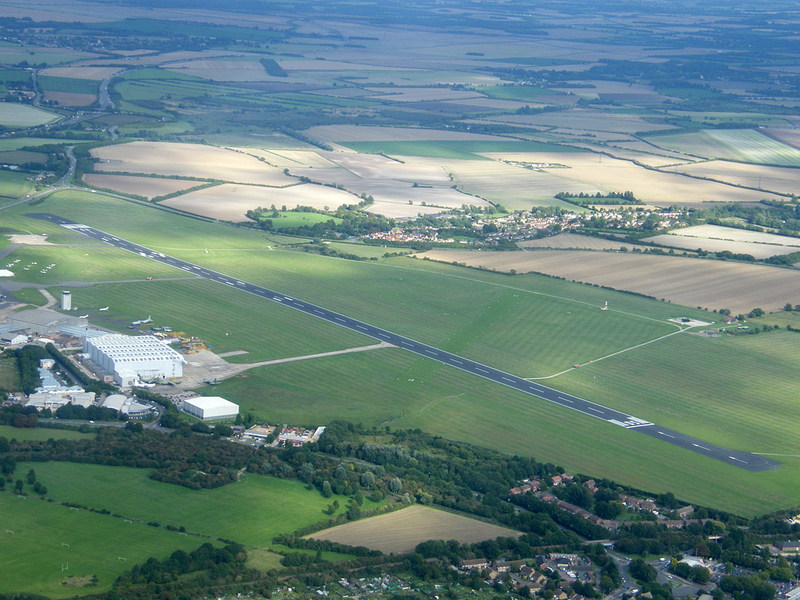 Power straight on before we came down again…….. anyone looking for how not to land, just had a brilliant demonstration. Properly rubbish, I couldn’t have got it more wrong if I’d tried. Funnily enough though I didn’t come away from the event demoralised, just with a touch of regret it could have been better. So good I can’t remember it….. Circuit seven is a bit of a blur, I have no memories of it being rubbish so it must have been ok.
I’d been left on my own to decide when to turn, when to take flaps etc. etc. for the last few circuits and so far my judgements on height and the glides had been pretty good. This one though was a fine example of the fact that if you have no power, once you’re low, you’re low for the duration and there’s not much left you can do about it. From 150ft up I knew in my mind this was was going to be cutting it fine for making the runway. It was just about looking ok to make it over the road which runs maybe a hundred feet before the start of the threshold, but making the runway numbers……doubtful, getting really doubtful by the second. As we approached touching down on the very beginnings of what you might consider runway (though strictly is pre-threshold and at best part of the maneuvering area), my instructor opened the throttle a little and gave us just enough power to push the plane forward so we touched down on the numbers. Done for real, we’d have walked away from it so it wasn’t unsafe, but you don’t really want to be landing there. I hadn’t been keeping count, it didn’t feel like we’d gone round the airport 9 times – though I’m sure air traffic control were sick of hearing my voice requesting a high glide by this point. 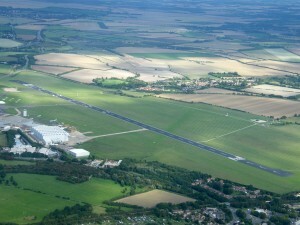 Another good circuit, flown at 1,500ft with an average landing. My instructor reminded me on landing to just let it keep rolling and there was no rush or need to exit at Charlie……..sure enough we rolled right past that exit before coming to a stop. Air Traffic Control cleared us to backtrack on the runway thus allowing us to go back to Charlie and exit there for parking. A good thing, Delta is miles away from the General Aviation parking – fun if you’re learning to taxi, a bit tedious if you’re paying £3/min to spin the propeller. All in all some positive comments, weighted by the fact I just needed to apply a bit more back pressure, let it settle, add a bit more, let it settle and keep doing it. If I was going to flare in one motion it needed to be a smooth constant motion. Looking back I think I kept wanting it to land/hit the runway, rather than sticking to the mantra of “try and make it not land”. Bizarrely the words that made landing all click for me in the first place. This entry was posted on Friday, August 10th, 2012 at 6:17 pm by PHC	and is filed under Actual Lessons, PPL Course. You can follow any responses to this entry through the RSS 2.0 feed. You can leave a response, or trackback from your own site.